Interactive Electronic Technical Manuals (IETMs) or Interactive Electronic Technical Publications (IETPs) (sometimes called Electronic Tech Orders or "ETOs") are technical manuals (such as maintenance, training, user or operations manuals) usually authored in XML or SGML and designed with an interactive user interface and illustrations. IETMs are a portable, electronic "library" which contain thousands of pages of maintenance documentation and graphics and allows end users to locate technical documentation in a more efficient manner, and the digital nature provides a more agile and accurate method of updating technical documentation. exceptional search capabilities, including searching text on graphics! Our dynamic system loads only the data you need, and then automatically loads more data as you scroll. This limits bandwidth requirements and provides an excellent user experience. Web applications are built on the Bootstrap framework. Responsive design means a single website will transition the layout conducive for smart phones, tablets or desktop viewing. XML data allows for the data to be used on a variety of devices. HEBCO's experience in markup language and our revolutionary software make the perfect IETM solution. Print fully composed data at any level, from a single paragraph to a subsection or even an entire chapter in PDF format. And the look-and-feel is just like a printed manual. Scalable Vector Graphics (SVG) provide print-quality illustrations as well as high-interactivity on devices. 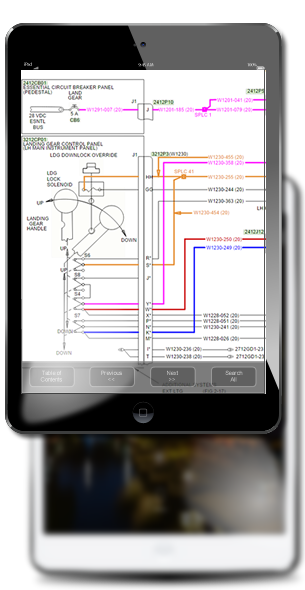 Highlight with color, trace wires and print wiring diagrams with ease. The combination of these items make for the highest quality software and customer satisfaction. Contact HEBCO today to learn more! Our IETM solution offers load-on-demand and fully print-on-demand technology - dynamically print a single, fully-composed paragraph or procedure, subsection or even chapter in PDF! The software automatically loads more data as you scroll up or down. This decreases bandwidth usage and load times. It also features fully composed print-on-demand; you can print an entire book, chapter or even a single topic or procedure all quickly and dynamically. All of this technology works on your desktop, smart phone or tablet! HEBCO IETMs can be delivered using S1000D, DITA or most any other XML standard. Class I - This Interactive Electronic Technical Manual class follows the structure and format of a printed book, with indexes and table of contents that are hyperlinked into the content of the document. This might be a scanned book with some links added. Class II - This format includes more hyperlinks than Class I, such as figures, tables and section references. A hyperlinked PDF document is the typical example. The document would be authored in XML/SGML. Class III - The difference between IETM Class II and Class III is analogous to the difference between PDF book and a web site. The book structure is discarded; instead the document is structured more freely following the logic of the content. The document can still be printed but it won't necessarily match the presentation on the screen. Hyper linking throughout the document is expected. The document would be authored in a markup language, typically SGML. Class IV - This class now expects the data to be stored in a relational database, obtaining benefits of data integrity and removal of data redundancy. Relationships in the content that are presented as hyperlinks are mapped directly to relations in the database schema. Redundancy in the data that exists in earlier classes should be removed. The sequence of presentation is also different than earlier classes. There is no longer the concept of a static page. Content can change dynamically based on user's navigation and input through the content; the content may now be user specific. It is no longer possible to print a linear format of the document. Class V - In this class, the documentation is now integrated with expert systems that may influence the display of content. For example, the IETM system may aggregate data from a large number of users input; feed that to the expert system that analyzes it and then the result gets fed back to the user through the IETM system. An analogy might be Google search, where search results are improved based on analysis of large data sets of previous queries entered by users. Should you require a custom solution, HEBCO implements a high-quality set of Agile processes that ensure that you get the best quality application possible. As with any project, it is impossible to know exactly what you want and also what you need. Agile helps mitigate these issues. Even our requirements gathering is an Agile process. Our Agile processes keep you informed and require you to participate - this is a much better way of uncovering and understanding requirements versus reading a bunch of abstract thoughts typed out on paper. HEBCO designs and develops software with revolutionary interface design along with some unique development processes to ensure you have the most usable, intuitive software possible.